SAMSUNG has demanded to see the next version of the iPhone. It is probably going to be called the iPhone 5 or the iPhone 4S. Samsung is requiring this to prove that there are no patent disputes or infringements. This all came a few days after Apple demanded that Samsung hand over the Droid Charge, Infuse 4G, Galaxy S II, Galaxy Tab 10.1 and Galaxy Tab 8.9 to see whether or not these products should be blocked. So Apple just got what they served up. The reason Apple can not just say “no” and not allow Samsung to see the upcoming products are because it is a court order. I find this odd because as far as Samsung knows, there is not going to be an iPhone 5/4S or iPad 3. But all of these lawyers know what they are talking about, so I am not going to question them. Below is the copy of the court order. IT is not a surprise. In this modern day world someone is almost always suing somebody else. They must think it can solve all of their problems. 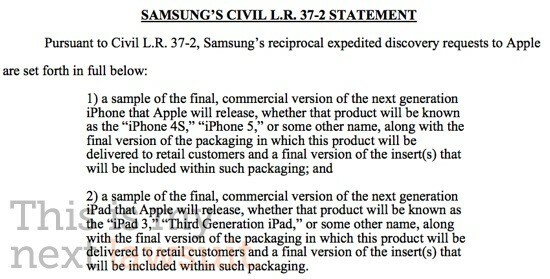 Anyway…This time Apple is suing Samsung. This time over the Galaxy Tab and Galaxy S. Apple Inc. is also suing other companies as well. Jobs’ claims that they copied their intellectual property. Here is the ‘copied and pasted’ version. Samsung joins HTC, Nokia and Motorola as companies that Apple has sued/is suing but the lawsuit with Samsung is particularly interesting because they have a business relationship: Apple uses Samsung manufactured parts in their devices! We’ll have to wait and see how this lawsuit puts a strain on their relationship. Here is the link to the story from Gizmodo. I highly suggest that you read it.